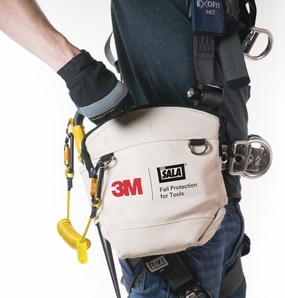 The 3M� DBI-SALA� Utility Pouch is constructed from heavy-duty 22 oz. duck canvas and features two side ears that are designed to hold spud wrenches and sleever bars. Two inner pockets are included in the pouch for additional tools. Tools can be tethered to two D-rings on the front of the pouch, or to an additional D-ring inside the pouch. Easily story your tools and hardware in this heavy duty canvas bag. Lots of space to store your tools on the outside for fast access, or the inside for storage. Tools can be tethered to D-rings on the inside and outside of the pouch for dropped object protection. Prevents objects from falling out when the pouch isn't being used.